Disneyland is more than a park, but a dream of one man, Walt Disney. As the story goes, while his daughters were playing on the merry-go-round in Griffith Park in L.A, he got an idea for a place that the whole family could go and play together. At that time, Disneyland the idea was born. After years of thinking of just a small little play area near the Disney studios, his designers began working on some concepts that grew bigger than the space they had, so after buying the 160 acres of orange groves in Anaheim the site was in place. "The happiest place on Earth" opened on July 17, 1955 one year after construction started.The day became known as "Black Sunday" because more people showed up than were invited, rides were breaking down, drinking fountains were dry , and ladies heels were sinking into the new asphalt poured that morning. When the park opened, it was divided into different lands; Main Street U.S.A, Adventureland, Frontierland, Fantasyland, and Tomorrowland. As the years went by, other lands followed like New Orleans Square in 1966, Bear Country in 72, and Mickeys's Toontown in 93. There was a hub in the middle of the park that led to each land. We all know the famous rides that the park has from Peter Pan's flight, Dumbo, Mr. Toads wild ride, and of course Jungle Cruise and Haunted Mansion . We love coasters here so coasters you will get. The park has four coasters. There is one kiddie and three of the most Iconic coasters in the world. Opening on June 14,1959 the Matterhorn Bobsled brought in a new age of coaster. It was the first tubular steel coaster built by Arrow. The feeling of racing down the mountain and hoping the Abominable snowman named " Harold" (by the Imagineers) doesn't catch you was heart pounding. With the 1970's came a neighbor in the form of Space Mountain. Opening on May 27,1977 two years after the ride opened at The Magic Kingdom ( part of the Walt Disney World Resorts) but on a smaller scale. With quick turns and sudden drops, the ride in complete darkness proved that Disney can build more than just rides for kids. 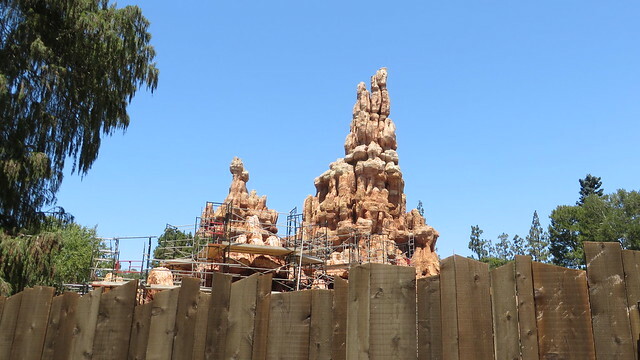 So not to rest on their success, two years after Space Mountain they open Big Thunder Mountain Railroad. Opening on September 2.1979 it became the second coaster built by Arrow, as Space Mountain was built in house. The steel coaster gets you down the mountain before any danger comes to you and adds thrills for the whole family.